What? You expected me to lead with, “Stay Gold Ponyboy”? 1983, really? It has been that long since the release of the Francis Ford Coppola piece? Twenty five years have passed…which explains my changed feelings for this movie. I have never read the book which was written by S.E. Hinton (a woman). I am perplexed that reading this has escaped me over the years. As an FYI – I see that she has a new novel coming out. The first one since 1983. Wow. The cast which was put together for this piece is unbelievable. To know them now but to see them together then….it is quite remarkable. Matt Dillon was Dallas, the ultimate bad boy. Can you explain to me why in the beginning of the movie, he chose to hang out with the two youngest kids vs. the ones more his age? Ralph Macchio was Johnny. I believe the number of years since I saw this movie last has faded my memories and I am now left trying to remember why I thought he was so phenomenal in this movie. C. Thomas Howell (who was an ex child rodeo star) was Ponyboy. I will get to my thoughts on this character shortly. Patrick Swayze as Darry Curtis, the older and over-protective brother and leader of the pack. OMG – his body is utterly amazing in this movie (greased hair or not). Rob Lowe as Soda Pop Curtis. I think one of the better portrayals in the movie. Emilio Estevez as Two Bit. I got a kick out of his character and his accent. I find it fascinating that IMDB notes his character as Keith “Two Bit” Mathews. I cannot recall their calling him Keith…. Tom Cruise was the high-pitched Steve Randle. What was with his voice in this movie? Those, my friends, are your Outsiders. In looking over their résumés, I see that none of these actors had more than five or so notable works prior to this movie. They were all virtually new faces. Now, some twenty five years later, all have scores of notable items to read through. First thing that struck me (and stayed with me throughout the movie) was the fact that Ponyboy cried over EVERYTHING. Every scene began with, included or ended with at least a few tears from Howell. To think of this movie being made now…I believe that, if put together similarly to Coppola’s direction, there would be some whisper of the homosexual undertones to the movie. This thought came to me when Ponyboy and Soda Pop are in bed and Soda rolls over to spoon with Ponyboy. I thought it again during the scene in the church where Ponyboy lays on the ground and Johnny lays kind of in his lap. There were a couple of other times in the movie that I thought this. Not that that is a bad thing IN THE LEAST. I just believe that if the movie were made now with the same direction people would make a big deal out of it. There is a Dairy Queen in the movie. It is the drive through that Dallas takes Ponyboy and Johnny to before the fateful fire. I heart Dairy Queen. There is one in Hinton, WV that is on the river. My grandparents used to take me there (many, many, MANY years ago). That brought back sweet memories for me. Of course I watched this movie on my commute to and from work. I finished it only a few minutes ago. I cannot help but think that the acting is really not all that good. They were still in their “raw” phase of acting, getting to know the lay of the land so to speak (I will tell myself this as I am genuinely surprised to feel this way about a movie I at one time loved). I am sure some of you die hard fans out there will chastise my thoughts on this. But seriously? The accents were horrible and the acting was not that great. Also, was I supposed to come away with the feeling of this being the Midwestern version of West Side Story? Go ahead, let the crucifixion begin…. I LOVE THIS BOOK!! !1 I AM OBSSESSED WITH ALL THESE CHARACTERS TOO! IM GONNA SEE THE MOVIE SOON!! IVE LOOKED AT ALLLLL THE MOVIE PHOTOS AND I ❤ SODAPOP!!!!!!!!! HE IS SOOO AH-DORABLE AND MOVIE STAR HANDSOME!!! AND I LOVE PONYBOY TOO, WITH HIS HAIR BLEACHED OR NOT HE IS FREAKIN HOT! JOHNNY CADE IS UTTERALY AH-DORABLE IN EVERY WAY!!!!!!!!!!!! I LOVE JOHNNY!!!!!!!!! RALPH MACCHIO IS A CUTIE!!!!!!!!!!!!!!!!! AND SO IS C. THOMAS HOWELL AND ROB LOWE!!!!!!!!!!!!!!!!!!! Well, I will admit, I have not yet seen the movie, but I have seen bits and pieces on youtube and plan to see the entire movie soon. I was disapointed to hear you have not read the book. It is a great read, and from the way you described the movie I am sure you will like the book more. There were also a few things that you mentioned that are in the book. You should really read it, and then you may find yourself liking the movie more. i love that you have the outsiders as your page. 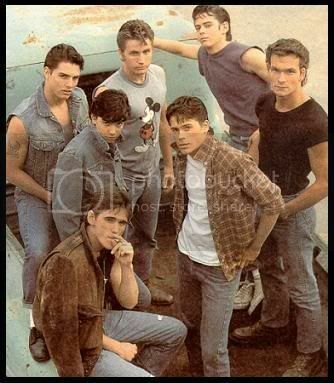 i love them and if they were my age i would go out with them… i love the outsiders. great job.